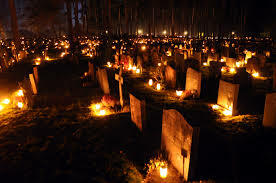 All Souls’ Day was first instituted at the monastery in Cluny in 993 and quickly spread throughout the Christian world. People held festivals for the dead long before Christianity and it was St Odilo, the abbot of Cluny, who in the 10th century, proposed that the day after All Saints’ Day be set aside to honour the departed. Some churches, hold special services and many visit the graves of dead family or friends.